A "B" picture with "A" aspirations, Bombay Clipper mostly takes place on a flight from India to San Francisco. Someone has absconded with $4,000,000 worth of diamonds, and that someone may very well be a passenger on the Bombay Clipper. International news correspondent Jim (William Gargan) hopes to solve the mystery for two reasons-to get a big scoop for his paper, and to repair his tattered marriage to long-suffering Frankie (Irene Hervey). Less than five minutes before the end, the jewel thief is revealed, whereupon the culprit tries to take over the plane and dispose of the other passengers. Fat chance! 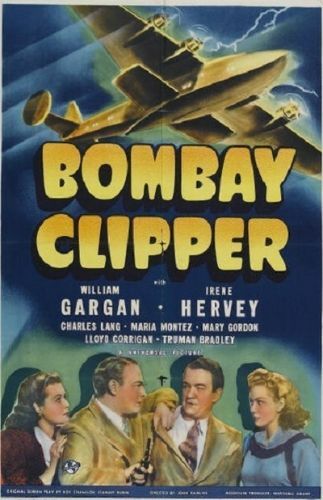 Obviously made on a tight budget, Bombay Clipper is nonetheless beautifully and meticulously photographed by Stanley Cortez, who on the strength of this and other Universal projects was signed by Orson Welles to lens the classic Magnificent Ambersons.